Thank you for all your prayers and support. Malaria is no joke, and I know with your prayers and Gods healing hand that is why I am feeling so much better. I’ve lost a bit of weight, which is hard to gain back here, but each day I am getting stronger! In just one week our team: Me, David, Jonathan, Melody, and their son Gideon will be traveling to Bungor, a village 4 hours away by bus, for another 2 week bible school. Please continue to pray for all of our health and that the hearts of the people at Bungor are ready to hear the word of God. 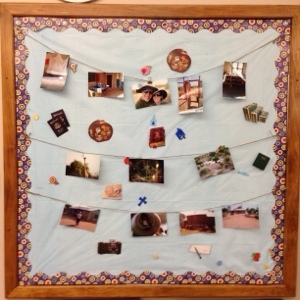 Thank you Denver South junior Sabbath school class for making a wall of prayer for us. I teared up knowing that we are not forgotten and that people are praying for us. Maybe it is the malaria making me emotional, but it really means a lot to us knowing that we are in this together. That we are not going through this in vain. That all the sickness, pain, and hard times are all worth it because we are all working toward the same goal. I have malaria… Please pray that I don’t vomit the Malarone medication up so that I don’t have to take Quinine (the side effects are right down horrible). Thank you for all your support. Other than malaria I’m doing great. God truly knows the end from the beginning. We are not traveling this week at all, so it’s the perfect time to get it if I have to. Also, it is really a blessing we have been here for over 5 months already and this is my first time getting it. God is good. Just one week ago I heard the words, “you got another one.” in my world this means another malnourished baby has come to ask for help at the nutrition center. I thought to myself, “oh man, another one?” we were planning a trip to Moundou (the big city where the place we stayed has a refrigerator and running water!). So another baby was more time away from planning and working out logistics. Since Wendy has left, it’s hard to have a lot of babies at the center. Also, David has to come with me every time to help translate for me which takes him away from other projects, and not to mention, it takes a lot of time to assess each baby. So I was not too excited to help this one. David and I quickly jumped on the moto and went out to the center to see the baby. I was surprised to see the mom AND dad there with the child (a rarity to see a father caring to come). I saw the baby and my stomach sunk. This baby was so thin and small. I knew it was way over my head to help this baby. There is a malnourished level that I am trained to deal with, but she was a baby that Wendy would have had to do since Wendy has a lot more experience. If I said, “sorry, I don’t have experience with this severe malnutrition” there is no one else she could have went to. I was her only chance. To me, it feels like I go to work everyday and find out that I walked into the wrong office building and instead of dealing with what I’m used to, I have to take someone else’s job that has way more experience than me and do something totally different than what I am trained to do, and if I fail lives are at stake. You would think I would learn, but for some reason I don’t. I keep going to the wrong office building hoping I will learn their job. So what did I do? I faked it. I faked being someone else in someone else’s office building. Kuma Kerrdbung, the baby as I came to know her, went through the normal assessment and I started her on the formula for severe malnutrition. The parents wanted to go home once they got the formula for the first day, but I insisted that I needed to watch her closely at least for three days. The dad was very insistent because they lived so far away and needed money for food. We finally worked it out that the mother would stay with the baby at the center and the dad would travel back to get the money and we would feed the mom while he was gone. So I watched Kerrdbung for three days straight. She took the formula well. A little diarrhea, but all the babies get that for some time with the switch from breast milk to the formula. After the third day I didn’t see any problems with Kerrdbung so I sent them home with enough formula until we got back from Moundou. We arranged that they would come back the very next day we arrived and I would assess Kerrdbung again. We got back from Moundou around 5pm on Monday and today went to the center. There were five other women with their babies there waiting for me, but no Kerrdbung. I didn’t really have time to notice besides thinking that the group seemed a little small. I reasoned in my head that I did send one women home last week because her baby did great and gained all the weight he needed to. I unlocked the office building and called them in one by one. As one mother was leaving and another was coming, Jonas our guard, relayed the news that Kerrdbung had died. Died? I felt sick to my stomach and thought of all the things I could have done instead. No, I thought to myself, she couldn’t have just died… she was doing fine. What happened? We wanted to do something for the family as a sign of respect so we arranged with Jonas that he will pick me up tomorrow morning and drive, by moto, an hour to the village where they live. Then once there, we will pay our respects. Unfortunately, here in Chad this isn’t the first time I’ve paid my respects to a family, nor the second, or third. In the 5 and a half months since I’ve been in Chad I’ve attended about the same amount of funerals as my whole life in the states. I don’t know about you, but death seemed so far away to me before coming to Chad. Maybe that has to do with being a twenty something year old, but even so, death was not an every day occurrence. Coming here makes me realize reality a little more. Life is hard, and for most, short. It seems like I just keep writing about the babies that die at the center, which almost caused me not to post this one, but to me they are something worth remarking about. I am still in shock and am so sad that perhaps I could have done something better. I could have postponed my trip to Moundou until next weekend. If only I watched her more. I could have tried to put an NG tube in if she wasn’t eating. Going with my analogy above perhaps I could have walked into the “right” office building that I belong in and learned my lesson the first time that faking it doesn’t cut it. I don’t know why, but God is calling me to this office building every day where I have to rely on Him for wisdom with every single baby. I fake things a lot and sometimes they work and sometimes they don’t. I know if I wasn’t here where God called me then who would be here for the babies? I could leave and say, “God will provide the workers who are experienced and able to handle every case.” But for some reason He keeps telling me to get up and go into this building. I know He is here with me helping me. I am more and more anxious for Jesus to come the more I work here. No more tears? That’s what it says…God will wipe them away Himself. Praise God for being such a loving and personal God. They should be on the plane en route now, less than 12 hours after hearing the news. Please pray for the Roberts family all around the world. His dad was the last mission pilot employed by the General Conference. The past several weeks have been very busy for us. We have been active in so many ways that we haven’t had time to blog, to keep up with newsletters, or anything else. God has been giving us a lot of work and a lot of blessings and satisfaction. Three weeks ago, Sarah and I joined Jonathan and Melody at Broum Tusu (for more info, see the blog post “Two Very Different Sabbaths) to do a week-long Bible training, trying to help them along in their spiritual walk. It was a very fun time. We got breakfast and lunch provided for us by the locals, which meant bouille for breakfast (rice, water, sand, salt, rice flour, sugar (usually, except not at Broum) plus lime, tamarind, wheat, or peanut butter sometimes for flavor), and boule and sauce (rice paste dipped in sauce) for lunch. We made our own dinners. The food is not bad, but because of their way of cooking it, it’s a little gritty and sandy. Anyways, the bible training went very well! We had a regular attendance of roughly 80 adults, plus Melody did a children’s story daily for over 100 kids. The group was very active, interested, and excited for the training they were getting, and very thankful for it as well. Friday, Sarah and I were asked to go see a lady who had engorged and probably infected breasts, and was having pain while breastfeeding. Afterwards, we drove an hour home, took a shower, and rested a little, then jumped back on our moto the next morning and drove back out to Broum to rejoin the Dietrichs for church. After church, Gary, Wendy, and Cherise joined us, we had a local lunch eaten the local way (grab the boule, pack it together, then dip it in the common sauce), then transported the equipment and the engorged lady back with the Roberts while we drove back on our moto. The next day God gave me a birthday blessing. I was supposed to leave with Gary for Cameroon, but due to a delay, we were postponed until Monday early morning departure. So I was able to spend my entire birthday at home, and sleep in a comfortable bed one more night. The next morning we left, picked up Dr. Scott in Moundou, and after a 2 hour misunderstanding with people at the airport in Moundou, we finally left, arriving in Yaoundé late morning. For an international flight, it was surprisingly easy. I thought they would be more complicated, as far as customs and stuff went. Anyways, we had received an overflight permit, but were only allowed to land at the main international airports. That put a wrinkle in our plans, as we had intended to take Scott to visit the Adventist hospitals in Cameroon to discover how he could best help them (there are no Western doctors in Cameroon because of security concerns from Nigerian gangs coming in to Cameroon and kidnapping whites) and offer additional training for the local doctors who may not know how to work with certain Western medical equipment, etc. After an unsuccessful attempt to get broader landing permissions, we visited the offices of the newly formed Cameroon Union, and the “old office” of the Secretary/Treasurer of the existing Central African Union who will soon relocate to the new Union office in Gabon. From there, it was decided that Scott would go by land to one of the hospitals, and we would go visit some other AMA projects near Douala. During the trip, we didn’t get to do everything we had planned, but it was a productive trip. We flew back to Yaoundé on Friday, picked up Scott, then flew back to Béré via Moundou. As soon as we landed in Béré, we immediately unloaded, repacked and refueled the airplane, traded Scott for Sarah as passenger, and took off for Pala, where we met Jonathan and Melody for another Bible training. That’s where we are now. I tried writing this blog several days ago, but we keep having phone issues and running out of charge all too quickly. But there has been some effective work and quite a few blessings from God as well. The training is going well, we had about 25 regulars and 30-35 present for the meetings per day. We expect the Mission (Conference) president to come tomorrow to close the training with us on Tuesday. Then we will be back to Béré, finally! But we are excited for how God is leading in our lives. It is now officially set, we are planning on returning stateside this summer. There are some organizational meetings we will be attending in August to get organized with people throughout the group. God has been providing locations, funding, and other needs for the meetings, as well as making group members aware of how we can work towards growth within the organization. After that, we are heading to Pathfinder Oshkosh to recruit. The initial plan was to get tickets with clubs, or individual tickets, but then they sold out. So we were going to try international tickets, and they sold out as well. I asked the Camporee if they still had space for vendors, and they not only had a booth available for us, but they provided it for free, and we can get tickets for everyone we need to help with recruiting! What a blessing. Now we have tickets for everyone who had had difficulties getting other tickets. At some point during our travels away from Chad, we hope to spend roughly a month and some in a Francophone country doing concentrated French learning for Sarah to get a step ahead in her communication skills. We are still trying to figure out what would be the most effective option to take in maximizing learning and minimizing cost. If you have any ideas, feel free to let us know! One thing we’d like to do, in a perfect world, is to time our trip to arrive just before everything, and then visit families and our church families, take French lessons in Quebec, then come back to the US for the FNCE Dietitian conference in October, then fly back to Chad right after that. FNCE would provide CEUs and great networking opportunities for Sarah with her nutrition work, which will be very useful in the future. But as many things in Africa, we can only say that is our hope “God willing”. He will guide us, whether in that way or another is His choice. It’s a lot, but I hope it has caught you all up with what’s been going on in our lives and missions, and we hope you’ll forgive us for the relative silence on the blog front. We love you all, miss you, and miss hearing from you. If we’ve been negligent in replying to emails, we will try to get to them soon. Thank you Corning SDA Primary sabbath school for sending crosses that say, “God” and “love” on them for the children here. 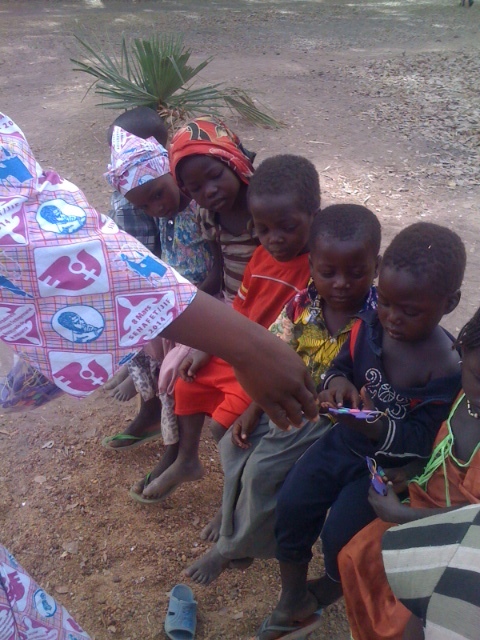 Here Cria, the primary sabbath school teacher, is giving the crosses to the children. After explaining what they said to Cria, she translated in the local language and taught a lesson using the crosses. Thank you for sending blessings from so far away!